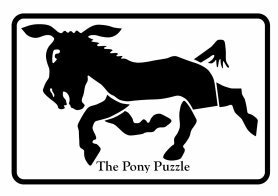 The Pony Puzzle is one of Sam Loyd's best known and commercially-successful puzzles. It consists of just six pieces of the silhouette of a horse, which have to be assembled in the most sensible way. 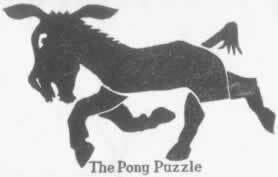 Loyd got the idea for the puzzle from the governor of Philadelphia, Andrew Curtin, when the two were on a steamer returning from Europe and talking about the famous White Horse of Uffington – a famous chalk figure carved on a hillside in Berkshire, England.